Starting from the beginning when I called to book my inspection the girl answering the phone was very helpful and knowledgeable. Donn was amazing he spent three hours on my inspection and picked out every small detail that was wrong with my house down to the batteries in the smoke detector. If you are looking to get a home inspection I would highly recommend Anderson home inspection. Amazing! This is the second time we have used Anderson Home Inspection. While the cost may be a bit higher than some of the competition, we have gone back to them as they are extremely detailed in their work and when making a significant purchase like a new home, you want to make sure you know everything that you can about it. Don and his team are efficient and too the point. If we are in the market to purchase again, I’m positive we would be going with them again. We have recommended them to friends and family numerous times and all are happy with a job well done. Highly recommend Anderson Home Inspection. Donn and Mike [I believe that was his name?] took the time to answer my questions thoroughly and respectfully. As a first-time home buyer, everything is a learning curve. They showed me things to look out for as seasons change, made suggestions that needed fixing asap, and all those small details that I would have never noticed. Donn is very knowledgeable, honest, and very professional. We enjoyed working with him and look forward to doing more business in the future. He arrived very early, did a thorough job and came very prepared. Donn Anderson was the ideal service provider for us as he was able to handle mold inspection and radon inspection along with the home inspection work. We learned a lot about the property, including information that’s been helpful post-move-in, and benefited from Donn’s experience. I highly recommend using Anderson Home Inspection for your home inspection needs. Donn Anderson has inspected two homes for me now. Donn is extremely thorough and knowledgeable. Both times Donn has pointed out things that I missed on my own viewings of the properties and I used his report to get concessions from the seller in both cases. Donn also has a nice web-based system so you will get your inspection report immediately when he has completed the inspection. Donn came highly recommended from from my family. I couldn’t be more satisfied with how knowledgeable he was and how personable he is. He made me feel like he was checking the house out for a family member. The inspection went smooth. He was very good at explaining what he was looking at and what he thought about any issues, even the minor ones. We were purchasing our first home and weren’t quite sure how to go about finding a good inspector. Definitely happy we found Donn! Thank you! Donn Anderson was referred to us by our realtor. Our appointment was scheduled quickly. Donn arrived early and began the inspection before my arrival. He was extremely thorough in his inspection. The report was very clear, detailed and available immediately after the inspection was completed. Donn and Dawn were very friendly and helpful. We would definitely recommend them to our family and friends. Donn is an outstanding person and did a great job in the inspection of the house I bought. 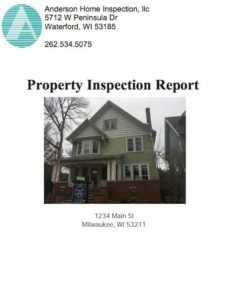 He has ample knowledge of construction codes of the state of Wisconsin and is very detailed when it comes to inspect a home. He picked minor issues that the home developer had overlooked and were later fixed. Furthermore, I like that he produced the inspection report right on the spot. Overall, I am very happy with the job Donn did, and would recommend him to anyone looking for a home inspector. Donn was AMAZING!! We just purchased our first home and Donn was great with us! He sat us down before he did the inspection and told us what was going to happen so we were prepared. He was very thorough with everything he showed us and gave us great tips on things we could do to improve things around the house that would actually help save on heating costs and such. I would recommend Donn to anyone!!!! I was able to get a home inspection scheduled very quickly. I also was able to pay for the inspection online. Donn even beat me to the home and was already taking some pictures/notes when I had arrived. He takes his time carefully inspecting every facet of the home and garage, taking his notes and photos along the way. He was very helpful and insightful while inspecting, answering any questions that I had. The best part is that his notes and photos are on his phone, so by the end of the inspection I received the full and well documented report in my email. Other places can take several days, so this was a nice surprise! 10/10 would recommend again! Fantastic and fast service! Very good experience throughout. Donn and his staff was professional and helpful in explaining the process. While going through the inspection, Donn would explain what he was doing and why, offering to answer any questions I might have. This is the second home inspection that I’ve had Donn do and was pleased with how thorough he was. I intend on using Anderson Home Inspection for my next home purchase. Highly recommended! Donn inspected the home we are purchasing and I walked away from the experience fully aware of the condition of the property. Donn took the time to point things out and answer the many questions we had during the inspection. His experience and knowledge were obvious and we feel confident from his inspection to move forward with the purchase. Don Anderson restored my faith in home inspections. I’ve talked to many different home buyers who were extremely disappointed in what they termed “a waste of money” in regard to home inspections in general. Don was completely dedicated to the inspection and us as his customer. He came highly recommended by a past buyer from 2005 who couldn’t say enough about their confidence in his service. He was completely thorough in appraising the condition of the property from top to bottom. Thank you, Don, for your opinion. Great home inspection. Donn was very detailed and walked us through each part of the inspection, taking extra time to answer every question we had (as first time home buyers, we had a lot!). Donn is extremely knowledgeable and did not miss a thing. At the end, we promptly received a very detailed report. He has been a great resource during our home buying experience – I would recommend him to anyone. My inspection was very informative, detailed, and helpful in making a good decision on final offer for my first home purchase. I would definitely recommend using Anderson Home Inspection to anyone who is looking for an educated and accurate portrait of all the things that should be considered when purchasing a home! Everyone at Anderson Inspection was a pleasure to do business with. Dawn, Donn, and everyone else i spoke to was very nice, friendly, and informative. I am moving to WI from out of state and don’t know much about basements. After my inspection, Donn took the time to answer all of my questions. He was patient and helped me understand all aspects of the report that I asked about. I would definitely recommend Anderson Inspections to anyone. I will use them again in the future. Donn was incredibly thorough. He took his time and went above and beyond the ordinary tasks and took time to explain everything. He treated us like family. The selling agent was nervous because she knew he did a very thorough inspection. But everything worked out and he pointed out a few safety issues that we were able to resolve before the sale was finalized. Thank you Donn! Donn was a pleasure to work with. He came highly recommended from several sources and did not disappoint. As a first time home buyer he walked me through anything that I had questions about and gave me several helpful tips for ways to improve the house to avoid future wear and tear. He was able to inspect the house very quickly and I had the inspection report emailed to me before he left. I would highly recommend him to any prospective home buyer, and if I ever need another inspection I know who I will be calling. Buying a new home can be a scary event. Thanks to Donn and his expertise, we felt reassured and at ease that our new house was just as perfect as we thought when we first walked through it. Donn was incredibly thorough and a wealth of knowledge. Donn found the Radon levels extremely high in the basement and we asked the sellers to fix before closing. My son’s new room is in the basement and I can’t thank Donn enough for finding the issue and making it safe for my son. Would recommend Donn and Anderson Home Inspection highly!!! From the very beginning Donn said he would look out for us like we were family. Donn was very professional and made me feel comfortable with knowledge to make very big decisions. I sensed my relator company, did not like my choice in home inspectors as he takes a lot of time. I felt as though I had the most thorough inspection money can buy, and that someone was truly looking out for my welfare. He goes above and beyond and has true experience that can’t be matched. He also has a list of people to work with that he has had positive relationships with in the past. I sincerely trust his judgement. My experience with Anderson home inspection was fabulous! He was incredibly thorough, working for over three hours on a week night inspecting our new home! He was able to find areas in the home that needed repairs, saving us over $2,000 in repairs the previous owners fixed prior to selling us the home! I will recommend this company to all of my family and friends who need a home inspection.